The last chapter introduced the DR-theoretic approach to abstract entity anaphora, on which various DR-theoretic structures derived from the DRS construction algorithm or C-abstraction may furnish antecedents to discourse referents introduced by pronouns. To handle the full range of abstract object anaphoric phenomena, however, one must be able to refer anaphorically not only to DR-theoretic structures introduced by the construction procedure but also to DR- theoretic structures constructed from bits of text that “naturally hang together.” These segments generate DR-theoretic structures that also serve as anaphoric antecedents. 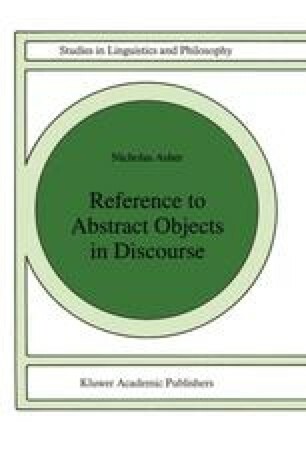 The main task of this chapter is to develop a formal theory of discourse structure and discourse segmentation suitable for the analysis of abstract object anaphora.